Color box for packaging, laminated color box would be treated with PE, OPP, wax and UV varnish for better appearances or water resistance. Those lamination materials, varnish, and inks are very challenging substrates for gluing. However, Tex Year hot melt adhesive can meet the specific demands of the customers. The bonding strength of Tex Year hot melt adhesive for laminated color boxes could be customized to cope with different levels of bonding difficulty packaging materials, packaging papers, or plastic materials, such as, PE coating, OPP coating, PP board, PE foam, UV matting agent coating. Also, Tex Year has developed the glues with temperature tolerances that ranges from -40~70℃, which totally satisfies the demands of color box storage under extreme temperature. Tex Year offers strong bonding, and cold resistant hot met adhesives for metallic silver board packaging. Including the color boxes made up of art papers, regular papers, paper boards, water based varnish, and solvent based varnish. Different bonding strengths are given due to the different treatments on color boxes. Applications on different types of color boxes. PE films are more extensible, which brings water resistance to paper boxes. PE coated materials are difficult to bond. PE coated papers are commonly applied to refrigerated foods and frozen foods. OPP laminated boxes bring water resistance to paper boxes. OPP laminated materials are difficult to bond. OPP laminated boxes are commonly applied to refrigerated foods and frozen foods. PE & PP coated, and varnished color boxes: PE films are more extensible, which brings water resistance to paper boxes. Freezing resistance box closing is commonly applied to refrigerated foods and frozen foods. 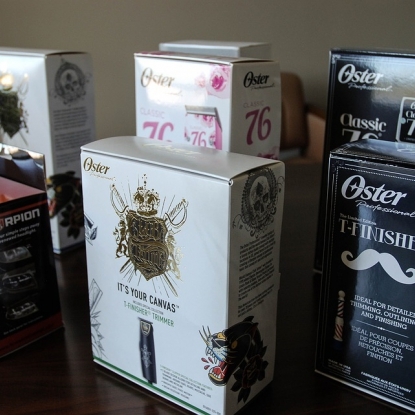 Liquor boxes and gift boxes are coated with UV oil on surfaces through printing blankets by UV printing techniques. Rollers would transfer specific pictures or holographic films to printed papers through rollers, which makes paper surfaces look like laser papers. However, it is difficult to bond. This technique is applied a lot on cigarette boxes, liquor boxes, cosmetics, and medical packaging. Highly transparent and resistant to both high and low temperature, and being able to applied on several materials. Adhesives should be colorless and odorless, suitable for big, small, and high speed transparent box productions. Tex Year hot melt adhesive can work with auto box closing operations.